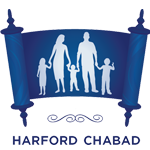 Harford Chabad is a family oriented, full service Jewish Community Center providing services for any Jew regardless of their background or affiliation. There is no charge to become a member at Chabad although donations are appreciated. Because many Jewish people in Harford County feel like they are “the only Jew in Harford County” and “the odd one out”. A few parents said “I was the one who brought Hanukkah Dreidels to the class and told them that we celebrate Hanukkah not Christmas. There are Jews and non-Jews who don’t have access to further education about the Jewish people. Chabad is here to fill those needs in a non-judgmental and warm traditional atmosphere. A system to help people experience spiritual growth and renewal through joining one of our programs or one on one instruction with the rabbi – a subject of their choice at a time of their choosing. Everybody feels at home at Chabad. Our community is comprised of people from across the entire Jewish spectrum, including the “ashke-fardic ultra-refo-conserve-dox”. Many people who have a non-Jewish spouse, consider Chabad their spiritual center. 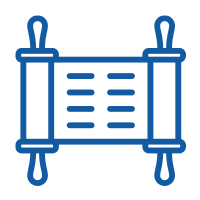 The Harford Jewish Academy -The primer resource for Jewish adult education. The Jewish Women’s Circle of Harford County – Where singles, young moms and women of all ages can be part of a global sisterhood. The Harford Hebrew School (A.K.A. Religious school or Talmud Torah) – where children have fun learning about their heritage. Chabad also provides resources for life-cycle events, addiction intervention, crisis and marriage counseling and referral services and any need you may have. As a young boy growing up in Long Beach, California I was enrolled in The Hebrew Academy of Huntington Beach. At Hebrew Academy the majority of the students in my class were “un-affiliated” and I was “the Rabbi’s kid”. The experience left a deep impression on me and I started to dream of moving to a place where there is a need for access to Judaism and Jewish traditions. Shortly after Fraida and I married and a short stint as the game show host of the Jewish Children’s Museum in Brooklyn, NY. We were appointed as the Chabad-Lubavitch representatives of Harford and Cecil Counties by Chabad-Lubavitch of Maryland. Fraida and I moved here in September 2010 after 6 months of meeting all types of Jewish people in the area. My personal goal is to meet EVERY Jew who lives or works in Harford County for coffee (or tea or a glass of water). Fill out the form below to remain in contact with Chabad of Harford County and to schedule a “let’s get to know each other” coffee with Rabbi Kushi.